Last night marked what I would consider the second meeting of the "Old Timers League." A few of us older guys get together for a little bit more laid back gaming. It's more of a focus on just getting out of the house, talking about everything home and hobby related and enjoying an evening of pushing little soldiers around on the tabletop. Last night we talked shop about all the 40k blogs out there these days, had pizza and managed to get a couple small games in. It makes for a nice evening of gaming when you can face off against a list you don't always see and everything is fully painted on top of that. I managed to get two games in at just over 400 points. Fortunately, as long as you were close point wise, it didn't matter. Both missions were Capture and Control using Dawn of War deployment. How's that for random rolling of missions? I lost both missions. I wanted to see just how much a single squad of Terminators could take. Turns out, not too much if they're not supported by other units. My first game was against Orks and I was outnumbered 6 to 1. Everything would have been great if it had ended on Turn 5, I would've even won. On Turn 6, it would have been a Draw, but naturally it went to Turn 7 where I lost miserably. The second game was even quicker, with only one troop choice at this point level, once they're gone, you can't even hold your own objective. Maybe I should have taken two squads instead of the Dreadnought. There's always next week. I do like taking chances when I deepstrike. I figure if you're gonna go, you might as well go big. The first time against the Orks, I scattered onto his Truk which resulted in him placing them on the other side of the table... in difficult terrain. 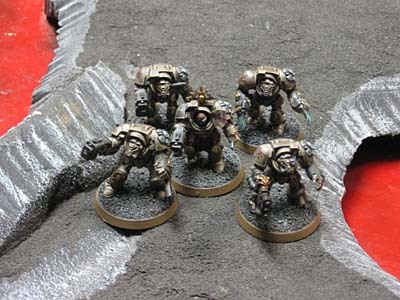 In the second game against Deathguard, I landed right where I wanted to which was good because it was a bridge and there was no room for scatter at all. All in all, a great night of gaming. 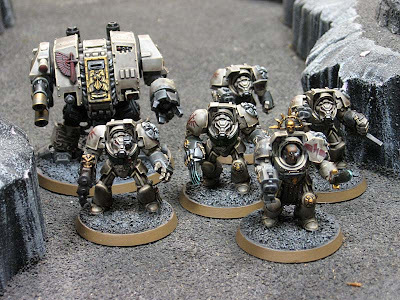 I think next week is more smaller point games (maybe I'll try two squads instead of the dread) and we're going to work on our greenstuff skills. 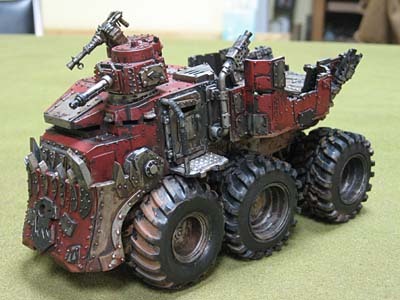 Those are some amazing Ork vehicle! Tell your buddy they are awesome, if you don't already do that all the time, ROn! love the story ron, wish I had a group like that in my neck of the woods. nice idea ron. I wish I could just play those smaller games with friends they are fun and don't take hours of concentrating. moving over to warmachine for that reason just chillin with smaller amount of models. Next week I'll see about getting some pics of all his Ork vehicles and such... kinda like an army showcase. Sounds like a great group. 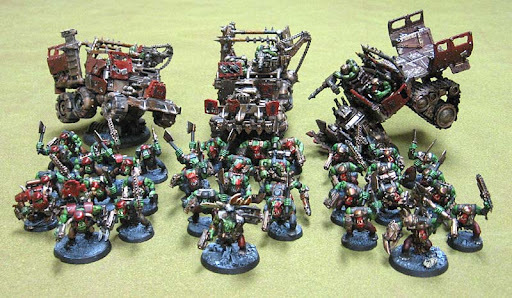 Looking forward to seeing more of those Orks!